We continue to invest in the renowned service that the construction industry has come to expect from IG. Our team of highly trained and responsive personnel are ready to take your call. Rely on IG, providing unrivalled service for 60 years! From first contact with IG you will know you are dealing with people who care about you and your business. IG staff are responsive, proficient, knowledgeable and receptive to any urgent requirements you may have. IG has a nationwide network of sales professionals with expert knowledge of both technical and commercial aspects of the steel lintel industry. Your IG Regional Sales Manager will make frequent depot, site and professional practice visits, to deal with all your IG lintel requirements. Steel Lintels in Stock IG’s fast, efficient delivery service is renowned throughout the construction industry. The logistics solution is recognised by its customers for superior supply chain management processes that help business flow. 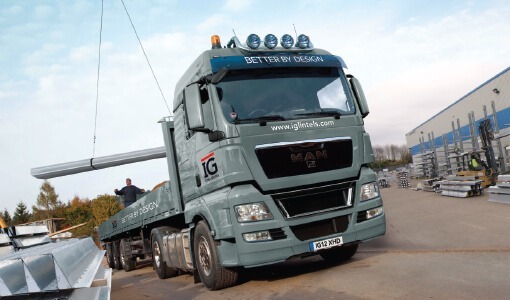 IG continues to provide the largest range of lintels available, with the shortest lead times in the industry. We have invested in large stock inventories at our 4 manufacturing and distribution centres which reassure our customers that all our standard lintels are instantly available upon request. IG has revolutionised the steel lintel industry by manufacturing and delivering “special” lintels with lead-times historically associated with ex-stock items. IG products are available through a national network of merchant suppliers.